Like another social-networking platform, WhatsApp has gained popularity very rapidly in Pakistan. increase its utility and attractive to customers, and to the users want to see it better and better. videos and PDF to PDF documents. 1. The new way to capture pics and shoot videos. can use 'flash' option for it, use the front-facing camera for taking self. screen while the fingers can also zoom in and zoom out. This will help to solve the problems of the picture through the cell phone camera. launched a similar nature feature for its users. which let's have fun or worry may aid with a hot pan and brush picture writing materials (Paintbrush), with this option, turned on his finger the user can change the image. WhatsApp has recently started to share information with the world's most popular social networking site Facebook. WhatsApp users regarding the use of this message have been sent. A user may have been the same without accepting gave no attention to the message or to offer and go. want to save yourself from this sharing feature has been provided for. Go to your account settings and share my account info, please change it to refuse permission "option. How to Turn Off Automatic App Updates on Android. GIFs called the language of the Internet world. You can also chat on WhatsApp in this language. Android phone users can use the feature to WhatsApp Beta. However, this feature is available for the whole OS. Attachments option for the users when using this feature will be in the gallery, and then it will see a new option there GIFs. Anyone can use it to chat to the desired GIF aid. Who knows WhatsApp group chat feature. This feature is very popular social networking platform. But because of this feature is that when you open the application you experience three or more messages from him. Which of them do not know that the message is for you? @Mentions. I will bring to you all the people in a pop-up menu, then type in the chat symbol "@"
Now you have to choose the person you want to chat with the message. He will now receive a notification, which will tell him that this is the chit. This feature will also tell the person who has left the group chat. 6.Written material is now more clear. and the last word of his work for the Stars must sign ed. the italic (underscore to write) in the diagonal pattern to a (_) sign written material before the first word and the last word. Write the words on the signs will be italic. To write words in the Strike through style sign (~) must use. It will also mark the first aid and last initial word of text. messages, photos, and videos to Google Drive. 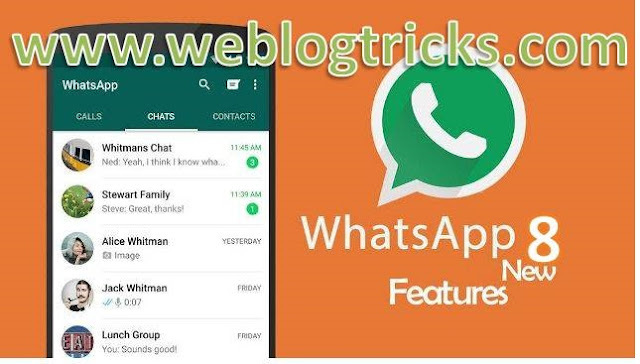 The whole nature of the features available on WhatsApp for Windows Phone users. This feature will work with Microsoft to drive one. The drive is one of the most reliable systems of storage. If you give the other party the message is too long. In view of this problem, WhatsApp has introduced a new feature. When you reply to a message, the message must click on the Reply button at the top of the screen to give you the quotation and the send your written response phase.